Updated Wednesday July 13, 2016 by Admin. My child wants to play hockey. Where to start? 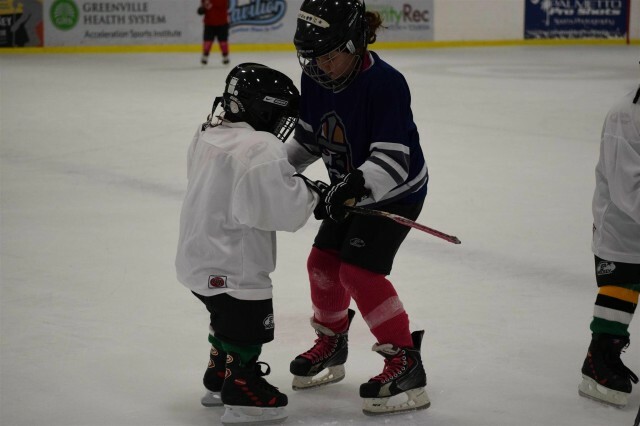 In order for your child to get the most enjoyment out of the ice hockey experience they should have a basic comfort level with skating before joining the GGHA House program. At a minimum, a player needs to be able to stand from a fallen position, in full gear, without assistance. We recommend new players take one of the “Junior Tigers Learn to Play Hockey” sessions at the Pavilion. Upon completion many new players can then move into the GGHA House program, usually at any time during the hockey season. Another good option is to try one of the “Try Hockey For Free Clinics” at the Pavilion and held multiple times during the hockey season. In addition, just having your child attend public skating sessions as much as possible are a great help in getting comfortable skating. How old does my child need to be in order to play hockey? "How many on the team are '99's?" Although it's unusual, players can play with an older age group in USA Hockey. However, they cannot play down to a younger age level. Our Frequently Asked Questions page is also a great place to start to answer beginner questions, espcially on equipment. used equipment is okay (It's more than okay, it's recommended for those just starting out) Look at the FAQ page for equipment options. don't skimp on skates and don't buy them too big hoping to save money as your player grows into them. Ill- fitting skates will make success much more difficult for your player. check the manufacturers sizing charts to purchase the right size equipment. Not all sizes are created equal. your new player doesn't need a $200 stick. brand new skates need to be sharpened before using them. You will need hockey tape...for the stick blade... the stick handle, and to tape the socks to your players leg (shinguards).